The foundations of education are shifting as teachers are challenging students to become problem solvers and think both critically and creatively. Often the historic significance and relevance of both “who” was involved in STEAM advancement, as well as the “when” of this evolution, is often getting lost. Quite often these factors are crucial to discovery and innovation. Take a walking tour to learn how modern science, technology, & art are woven into fabric of the City; and the revolutionary role of New York City in the history of STEM/STEAM on the streets of Manhattan. 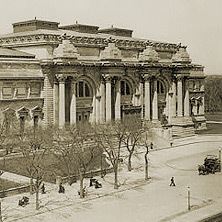 With stops at Cooper Union, The Northern Dispensary, Gallatin Hall, Jimi Hendrix’s recording studio, and Gertrude Vanderbilt Whitney’s 8th Street Studio, we learn how New York, and the people of our City – both famous and lesser-known – have always been on the cutting edge of the modern world. Explore the Metropolitan Museum with a Big Onion art historian!